Among the signature pieces in the collection of The Duchess of Cornwall is this demi-parure (matched set) of a diamond necklace and earrings. Each earring has a cluster of pear shape diamonds dangling in a long row, with perhaps one round diamond at the stud (always difficult to see the details on her earrings, because of her hair), for a total of 11 large diamonds apiece. The necklace features oval/marquise diamonds in an orderly arrangement of stacks of two diamonds separated by single diamonds on the necklace base and a series of pear drop diamond pendants that alternate between small and large sizes. The set is usually reported as having been made from the stones of a tiara purchased by The Prince of Wales which was dismantled to create these jewels for Camilla (said to have been the individual tiara shown here). I do not believe this has been officially confirmed; the large center pendant on the necklace does have a small hook underneath, though, which could be the remains of a previous setting (among other possibilities). The demi-parure first appeared on The Duchess in November 2005, during the couple's first tour of United States together. Both pieces have been worn several times, but the earrings in particular have become favorites. 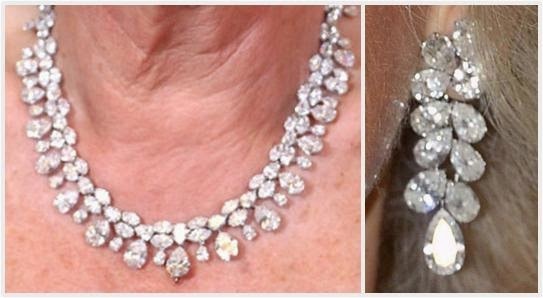 They are often worn with other necklaces or when no necklace is worn, and are often seen at tiara events. The diamonds are individually quite large and well-matched in these pieces, an unusual feature that sets this demi-parure apart. It's even more luxurious close up than it seems from afar, and a positively drool-worthy addition to a royal collection.